The style of Martial Arts taught at The Institute of Karate Rockdale and Bexley is Ryu Bujutsu. Bu’ (術) translates to warrior, military, chivalry or arms. ’Jutsu’ (術) translates to art, technique, skill, means, trick, resources or magic. your goals and win at life. 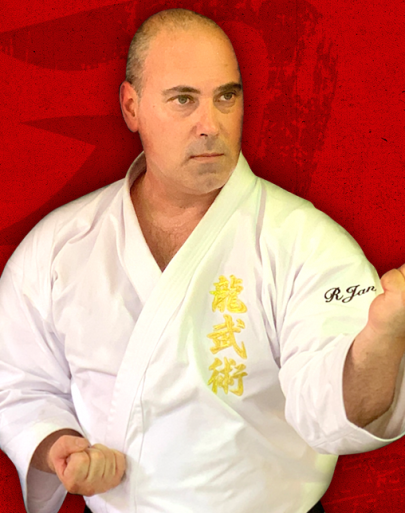 Sensei Robert is a 7th Degree Black Belt who started his training in the early 80’s with Kempo Kai Karate having been involved for 38 years with in the martial arts, in that time and present has trained with great instructors seeking knowledge in styles such as. Ju Jujutsu – Brazilian Jujitsu, Grappling – Kickboxing. Throughout the years he has also had the privilege of owning his own security company offering Bodyguard services to clients from around the world such Presidents and Archbishops on their frequent visits to our country. Sensei Robert has over the years trained 100s of students at state and national competitor levels. The sensei is an amazing teacher. He really has a passion for his art and inspires his students. This type of karate is really good for kids to learn discipline and commitment. It’s like family here, so welcoming and friendly. The dojo is a very special place, with a welcoming community of friends and the seniors are always open to teaching the newcomers. They are very generous with their time. My kids have embraced the karate spirit and have learnt resilience and focus in their years here. Sensei is an inspiring coach and mentor and no two lessons are the same!